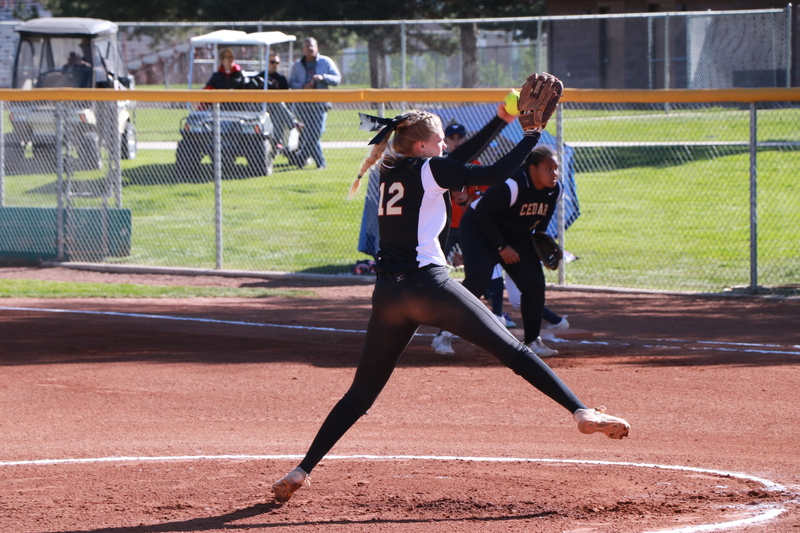 CEDAR CITY — The Cedar Lady Reds softball team won both of their opening-round games at home Saturday, beating Orem 13-1 and later coming from behind to defeat Mountain Crest 6-5. 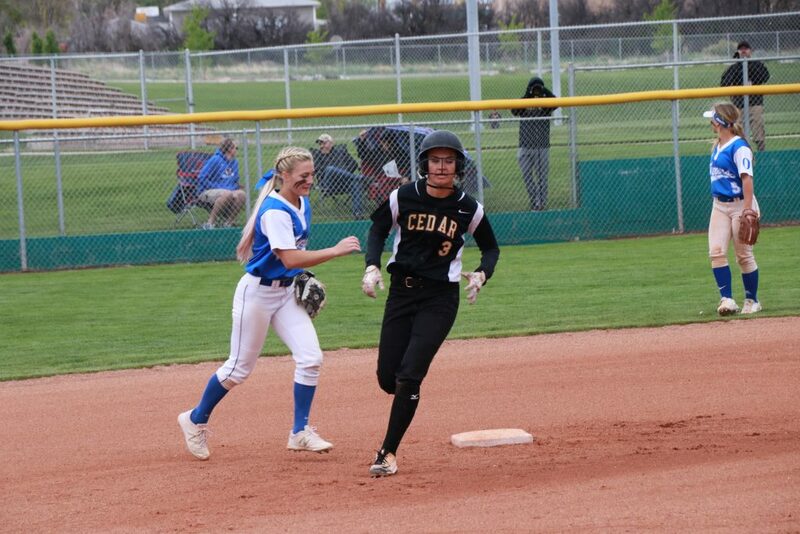 The pair of wins puts Cedar in the quarterfinals of the state 4A tournament, which continues next week at the Spanish Fork Complex. 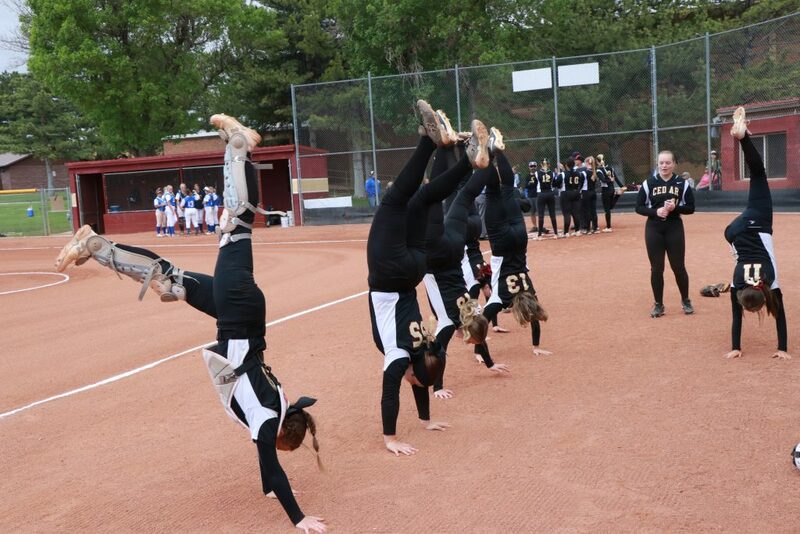 The Lady Reds jumped out to a 10-0 lead over Orem after two innings and went on to win 13-1 in five. Cedar’s Dream Weaver and Denim Henkel hit back-to-back solo homers in the first inning to put the Lady Reds up 2-0 with one out. Pua Johnson was up next, and the Tigers opted to send her to first base via intentional walk. 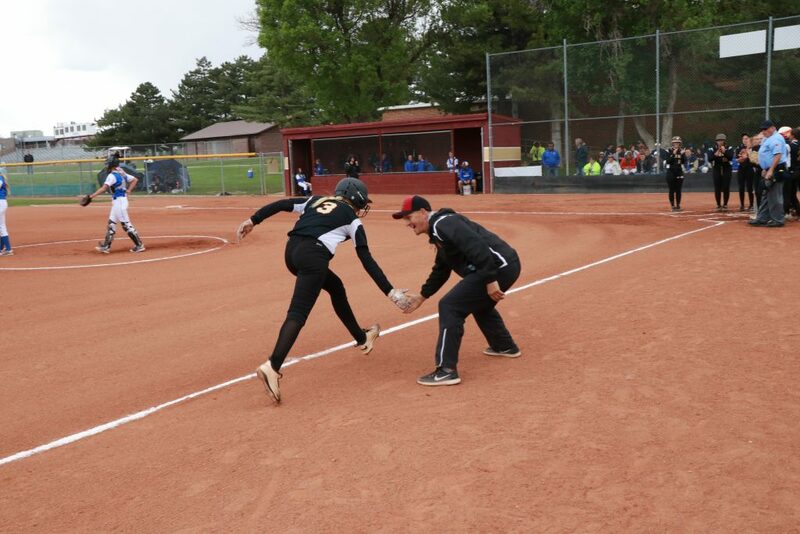 Kylie Oldroyd then walked, after which Amanda Cardon laid down a bunt single to load the bases. Sage Oldroyd then singled to left, bringing in her younger sister and Cardon, and the Lady Reds led 4-0 after one. In the second inning, Cedar scored six additional runs, thanks to four hits and three walks. After Cedar loaded up the bases on three straight walks, Kylie Oldroyd and Cardon hit back-to-back doubles that each brought in two runs. 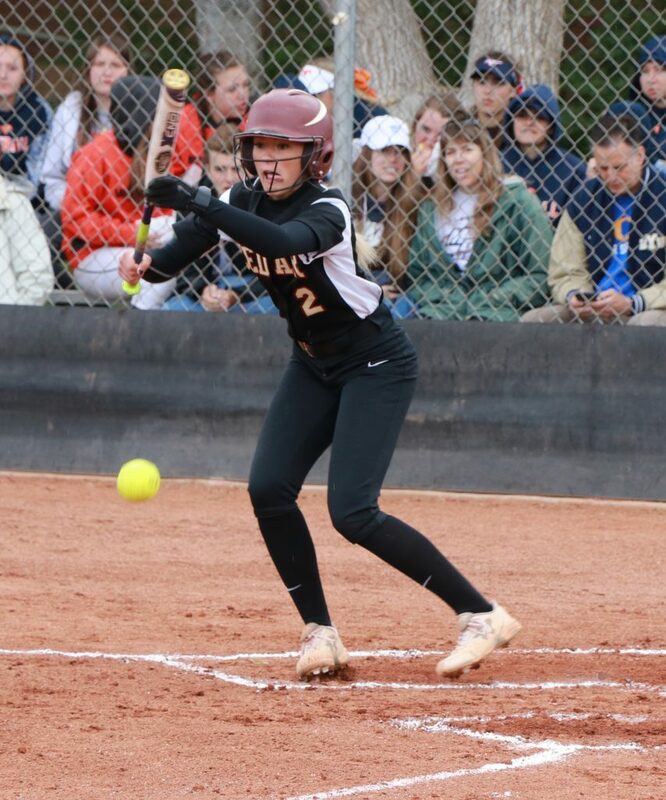 Neither team scored in the third or fourth innings, but Orem did manage to get on the scoreboard with a run in the top of the fifth, thanks to catcher Emily Poynter’s RBI single with two out. Cedar entered the bottom of the fifth ahead 10-1, needing just one run to end the game via the mercy rule. Allie Meisner led off with a walk, after which Weaver singled. Henkel then knocked a three-run homer deep into the trees beyond the left field fence, ending the game. Henkel finished 3 for 3 at the plate with three runs scored and four RBIs. 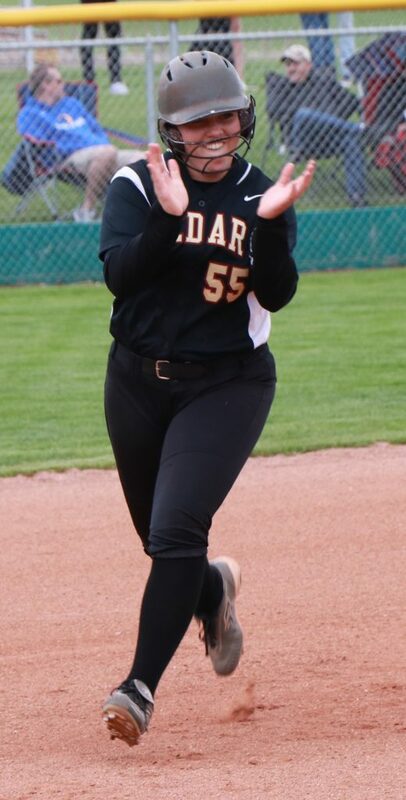 Junior pitcher Kenzie Waters went the distance for Cedar, allowing five hits while striking out six. Megan Poynter was the losing pitcher for Orem. In the fourth and final game of the day, Cedar faced No. 3 seed Mountain Crest, which had upset No. 2 seed Stansbury in the 10 a.m. game by a score of 13-7. 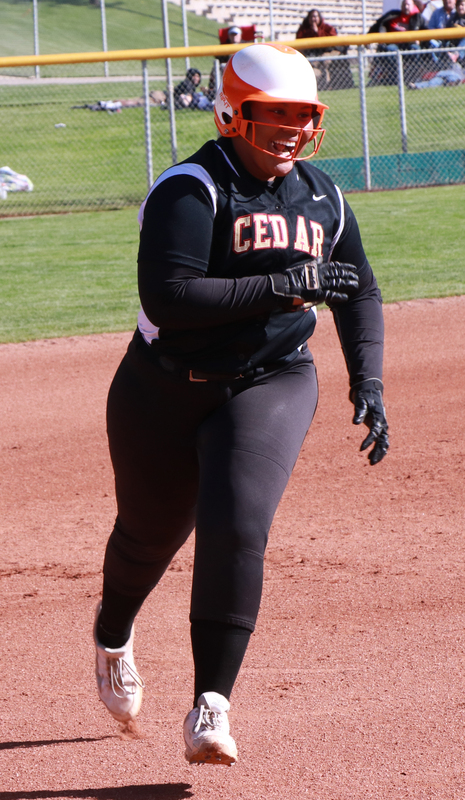 Cedar trailed at two different times during the game, but a late solo homer tied the game 5-5 in the sixth inning, setting the stage for the Lady Reds to prevail in the decisive seventh and final inning. Pua Johnson drove in the game-winner with a one-out single. The Mustangs grabbed a 2-0 lead in the top of the first. 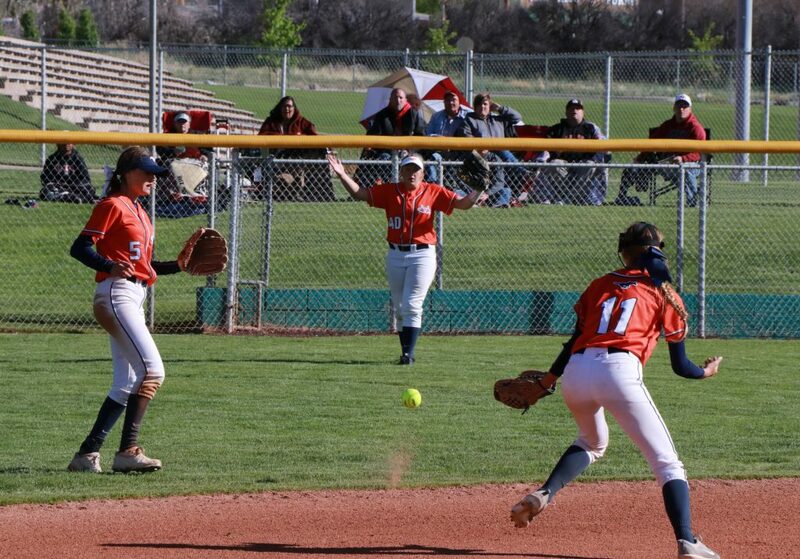 Mountain Crest’s leadoff hitter, freshman Madison Bertagnolli, led off with a single, after which she advanced on an infield grounder and scored on teammate Haylee Brown’s sacrifice fly to left. The next batter, Jocilyn Norris, reached base on an error, after which Jessica Touchard doubled to left, scoring Norris. Cedar then answered with three runs in the bottom of the first. Meisner led off with a single, after which Weaver and Henkel both singled. Weaver was thrown out at second by the rightfielder on Henkel’s hit, which scored Meisner. Johnson then homered, scoring herself and Henkel, and Cedar led 3-2 after one inning. Neither team scored in the second or third innings. Cedar led off the second and fourth innings with a single, but came up short both times after infield popups were turned into double plays by the Mustangs. Cardon did manage to make it home on a passed ball in the bottom of the fourth, giving Cedar at 4-2 lead. 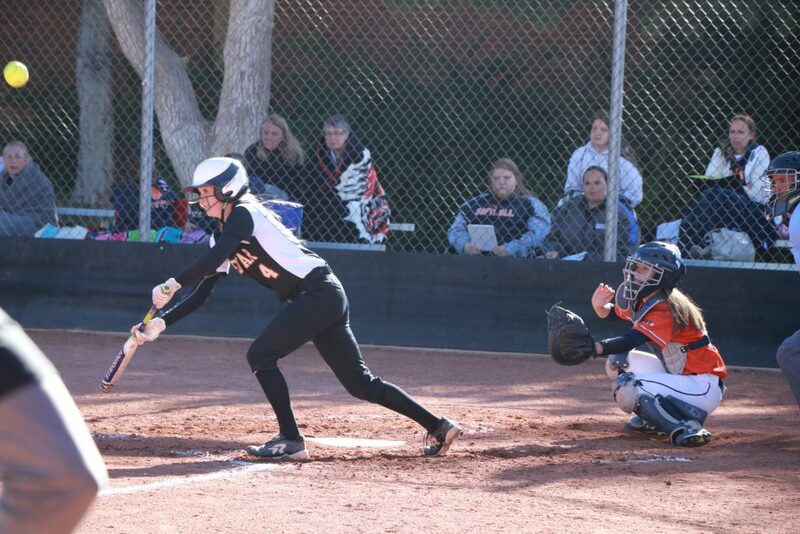 In the top of the fifth, Mountain Crest rallied to regain the lead, getting three runs on four hits. Bertagnolli led off with an infield single to first base. Ana Tidrow then grounded to short, and Bertagnolli was thrown out at second. The next batter was pitcher Brown, who grounded to second. Instead of throwing the ball to shortstop Weaver at second base for a possible double play, Meisner opted to get the out at first. 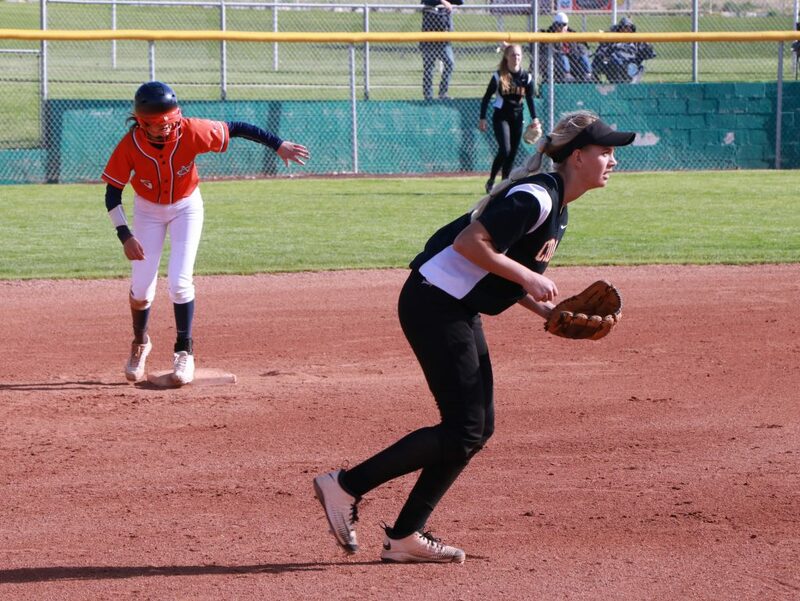 Mountain Crest then went on a two-out rally, stringing together three successive hits, with Tenna Child, Touchard and Madison White each driving in a run. The latter two hits were doubles, and the Mustangs regained the lead. Cedar pitcher Bryton Holyoak then struck out Maysen Bryson to end the inning with two Mustang runners on base. 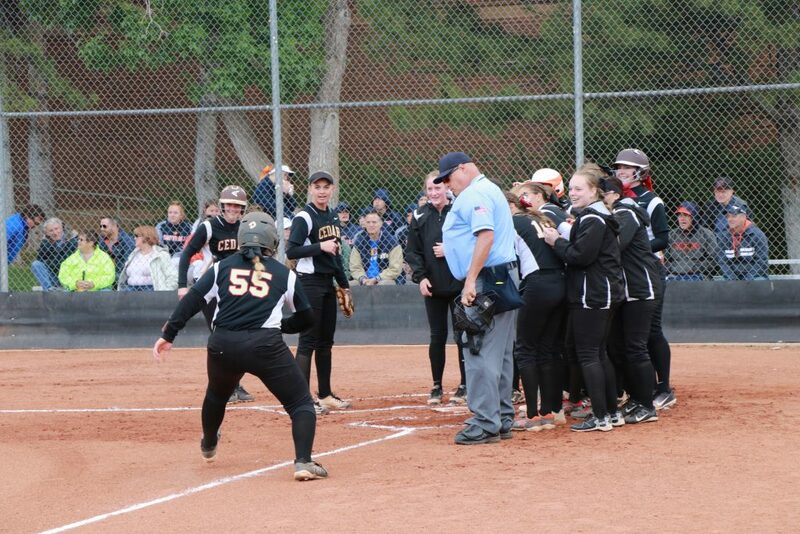 Cedar was unable to score in the bottom of that inning, so Mountain Crest led 5-4 after five. Holyoak picked up two more strikeouts in the sixth as the Mustangs came up empty. In the bottom of the sixth, Cedar’s first two batters flew out, but Sage Oldroyd drilled a home run to deep left field to tie the score 5-5 with two out. 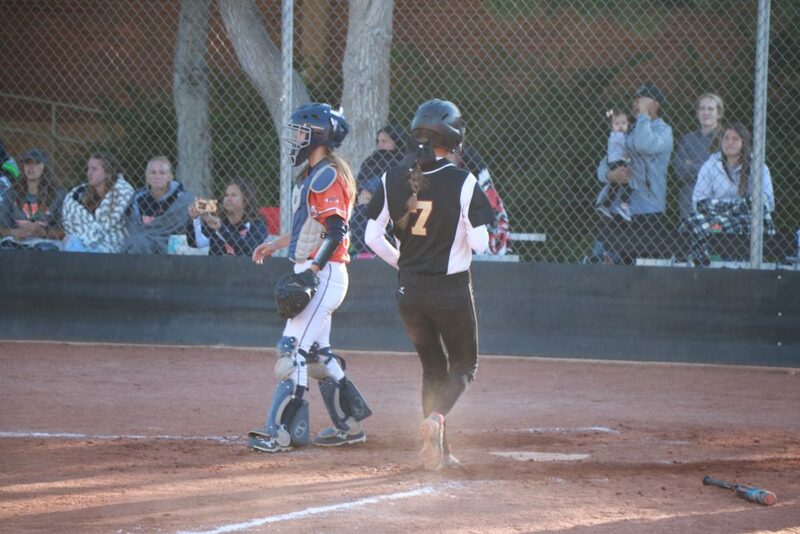 Mountain Crest only got one runner to first base in the seventh, as White walked with two out. Norris then grounded out to third. As the Lady Reds took their last at-bats, they knew they just needed one run to win the game. Dream Weaver said putting the Tigers out so quickly in the top of the seventh helped motivate the Lady Reds to end the game. Abby Anderson, the team’s catcher, led off the seventh with a single, after which Meisner also singled. Weaver was then sent to first base intentionally, loading the bases with no out. Henkel then hit an infield grounder, and Anderson was forced out at home plate. With the bases once again loaded, Johnson singled to right, bringing in Meisner and ending the game. Holyoak pitched the entire game for Cedar, allowing six hits while striking out five batters and walking four. Brown pitched the entire game and took the loss for Mountain Crest. 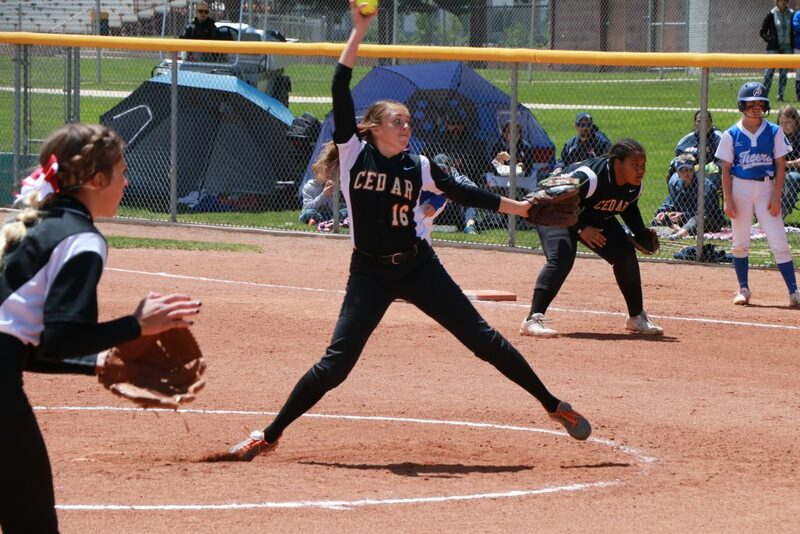 Cedar next plays in the state 4A quarterfinals Thursday at 3:30 p.m. at Spanish Fork. 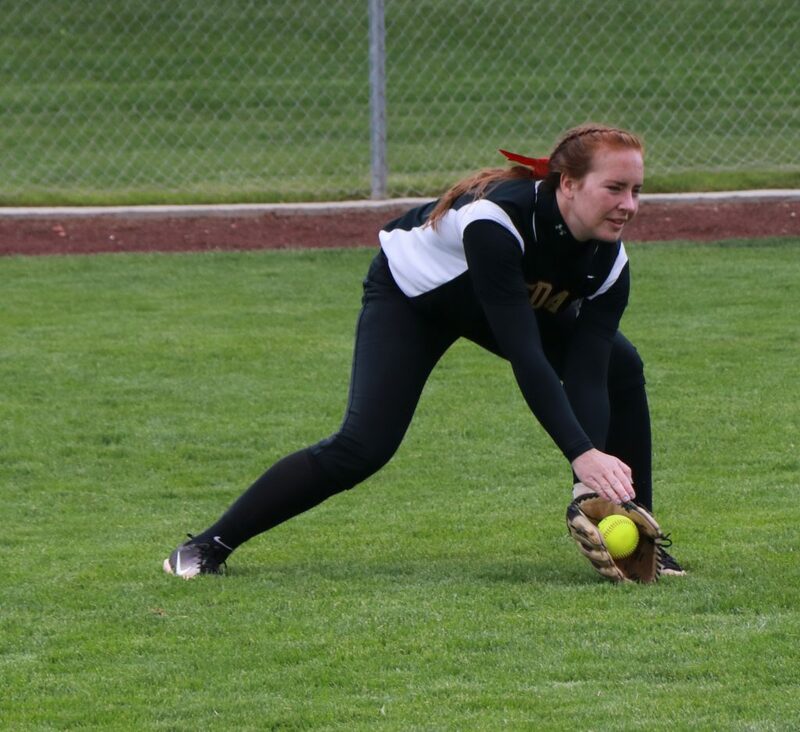 The Lady Reds’ opponent won’t be known for a couple more days, however, as the opening-round games at the other three regional 4A pods originally scheduled for Saturday were moved to either Monday or Tuesday, due to rainy weather. 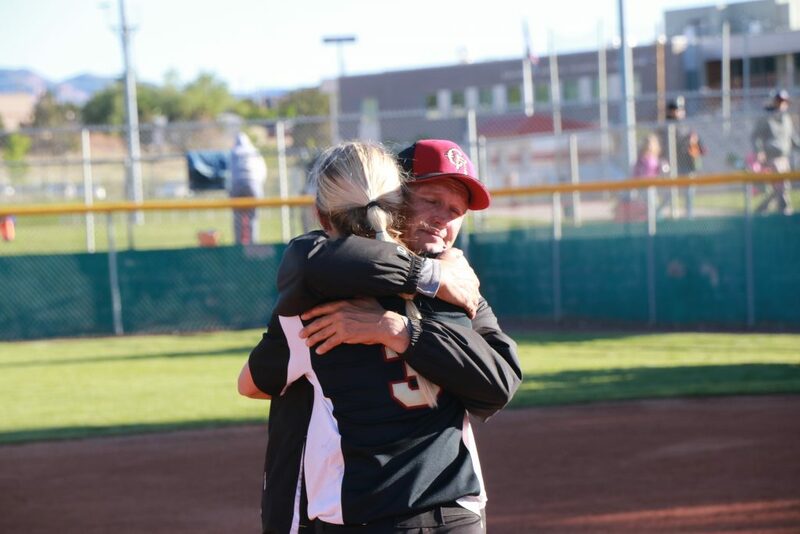 Orem, which held on to beat Stansbury 7-6 at Cedar City Saturday afternoon, and Mountain Crest will both play opponents yet to be determined Thursday afternoon in the one-loss bracket of the double-elimination state tournament.